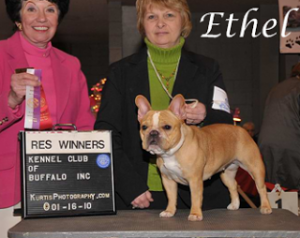 Ethel winning at an AKC show. 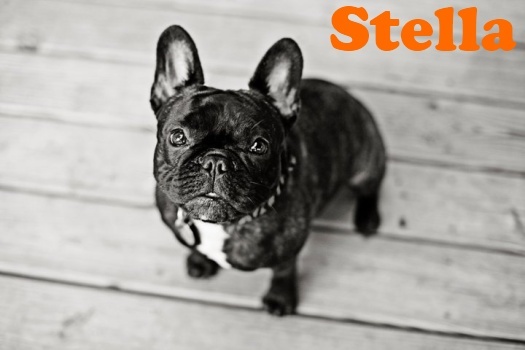 This is a perfect example of why we love to stay in touch with our BlueGrass families and of how they love their frenchies so much the word just spreads. Ethel’s family told friends about how much they loved their girl and their friends then bought Frankie from us. The two were a match made in heaven and they were soon to be wed. Really? Yup, I couldn’t make this stuff up, guest, attendants, cake, party and honeymoon. What fun. 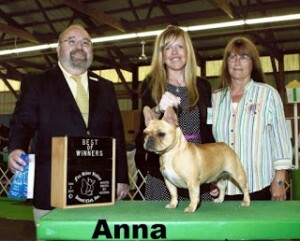 Anna belongs to a mother and daughter team. Barb and Tiffany love her to pieces are having a ball taking her to the AKC shows. As you can see she is loving it and winning.